The Door Campaign (TDC) provides unique, interactive STEM experiences for middle and high school students. Aquaponics is at the heart of our STEM education approach, helping students learn about biology, ecology, sustainability, and healthy eating. The field of aquaponics combines raising fish (aquaculture) and growing plants without soil (hydroponics). Want to learn more about our Youth STEM Program? Check out our 2017-18 infographic and impact brief. Classes enrolled in our Youth STEM Program are matched with a TDC site mentor, and equipped with our Aquaponics and Sustainability Curriculum complete with an in-class aquaponics system. TDC’s Aquaponics and Sustainability Curriculum features lessons on ecological relationships, nutrient cycles, fish anatomy, aquatic chemistry, sustainable agriculture, and urban sustainability. We encourage discussions about human impact on the environment, food systems, and nutrition. Our unique curriculum is aligned with the Pennsylvania Common Core Standards, Next Generation Science Standards, and Biology Keystone Assessment Anchors. 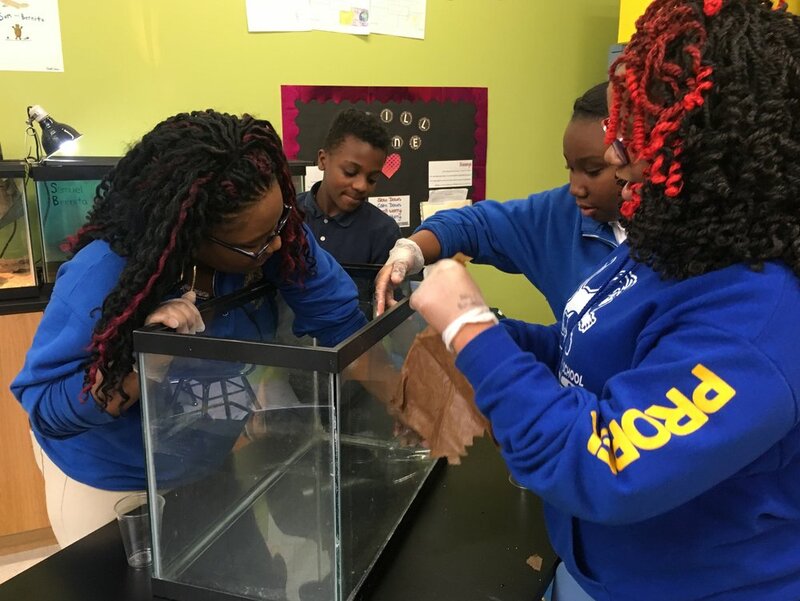 Students have an opportunity to keep tabs on the growth of their fish and plants, monitor aquatic chemistry, observe firsthand the flow of energy in an ecosystem, and problem-solve as they develop a sense of ownership over their aquaponics system. Since 2014 The Door Campaign has worked with teachers and students at Perry Traditional Academy to bring our hands-on science education to the classroom. Our school partners during the 2017-2018 academic year include Brashear High School, Perry Traditional Academy, and Schiller STEAM Academy, Propel Schools (Braddock Hills Middle and High Schools), Manchester Academic Charter School, City Charter High School, Environmental Charter School, and Manchester Youth Development Center. We offer experiential learning opportunities that extend beyond our curriculum. Beginning in 2018 we are partnering with Eminent Hospitality's EAT Initiative to bring cooking demonstrations to our classrooms, Chatham University's Eden Hall Campus, and Allegheny Land Trust's K-12 Education program to offer field trips to local ecological restoration sites. Ready to enroll? Complete our 2018-19 School Application form today!